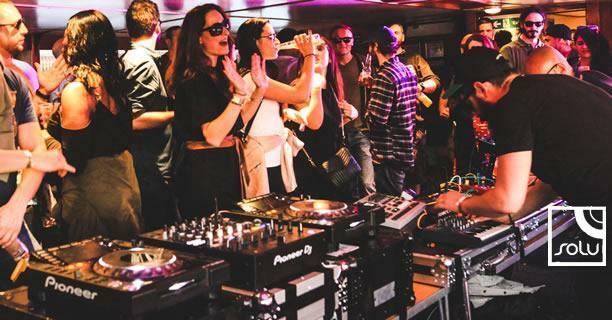 We've been putting on club nights on the river Thames for over 10 years..
...and it's fair to say we love them! Come and join hundreds of other satisfied clubbers who have partied on our fantastic club boats. Each of the boats holds 240 partygoers over two decks and is an excellent way to treat your regulars to an afternoon or evening of music and fun, and as all boast excellent sized sundecks and bespoke DJ booths, you are ensured both clubber and DJ satisfaction. Use our online quote calculator to create a free, bespoke quote for your London club night. Please note that because we own these boats, booking directly with us will avoid you paying any agents fees. *10% discount for BIIAB Professional Award for Music Promoters cannot be redeemed in conjunction with any other dicount or offer. Everyone's got a favourite - which one's yours? 2 decks means you can have one level of muic and a chill out area, or 2 levels of music. Throw in the massive sun deck and your summer club event is complete. There's a full set of top spec DJ equipment to hire, or you can bring your own. 2 decks, 240 people, pumping sounds, lots of flexibility. Similar in layout to the Golden Flame, the Jubilee is a firm promoters favourite. DJs are happy in their self enclosed DJ booth, clubbers are happy either on the dance floor or out on the sun deck soaking up the sights and sounds of London. Full DJ spec available to hire with CD-Js as standard, or you can bring your own. The smallest of our club boats but by no means the shrinking violet the Golden Sunrise is also on 2 levels with a bespoke DJ booth and split level sun deck, and the same professional DJ equipment to hire as the other boats. She is a little smaller than the Golden Jubilee and Golden Flame and as such we recommend her for functions of up to 200 passenger which is of course reflected in her hire rates. Her licence, however, does allow her to carry 240 passengers which we can accomodate should you wish. During the evening guests can enjoy the spectacularly lit, ever changing views of London, whilst on a summer afternoon the extensive sun decks are the ideal place to soak up the rays with a drink in your hand. If you are unsure which vessel is most suitable for your function, use our quick reference guide to help. We like to interview our club promoters regarding their up coming events on our vessels, click here for the latest interview. All vessels are available for afternoon functions between midday and 6pm, or evening functions from 7pm to 1am. We are also able to make additional stops to accommodate any DJs who can’t stay onboard for the whole function (although additional charges may apply). Because of their unrivalled reputation (hey we can't help word of mouth) our boats the Golden Jubilee, Golden Flame and Golden Sunrise get booked up months in advance, so please contact us immediately with provisional dates you require to avoid disappointment. Provisional dates can be held for 7 days free of charge, after which time we require a 25% deposit to secure the date. You can view our full terms here.